A popular look and revitalizing trend is renewing the aging industrial buildings around our cities and towns into more useful structures -- like gathering places to talk, have fun, and yes -- drink beer. 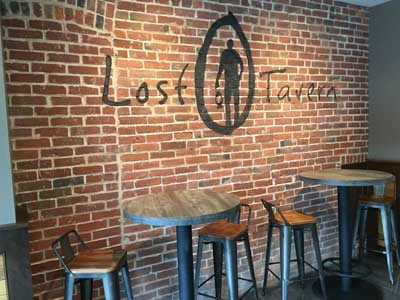 One such place, Lost Tavern Brewing in Hellertown, PA, is a great new watering hole for locals. 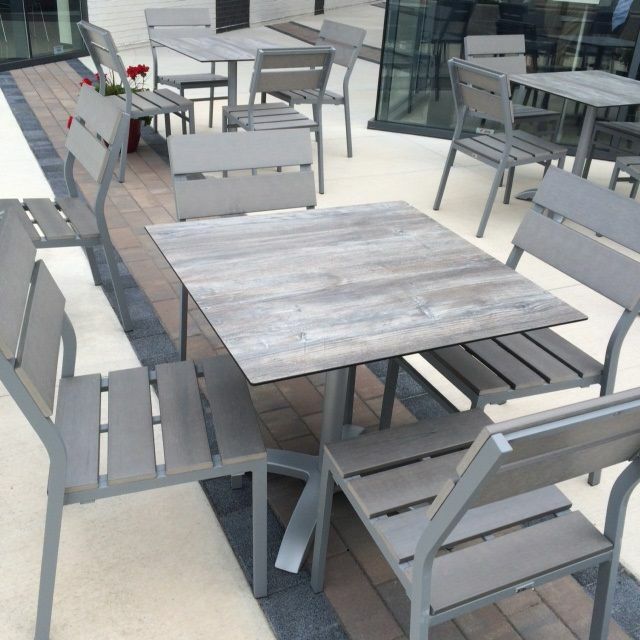 Outdoor Restaurant Seating is proud to have supplied them with their commercial restaurant furniture to make the place comfortable and awesome. The partners decided to use the natural looking driftwood laminate tops which are modestly priced and easy to clean and always look good. Complimenting the tops are the Lima clear-coat steel chairs that show off beautiful brass welding and capped with a smooth wood seat. The interior of the brewery ties together wonderfully with the exposed brick, natural wood, glass and steel. Outside, a sharp but natural look awaits arriving guests with synthetic teak tables and synthetic teak seating (barstools and arm chairs). Its a great place to watch traffic, people watch, and enjoy a cold one. As visitors will tell you, Winery 32 is beautiful. Apparently, the word is out and Winery 32 decided to expand with a new deck with additional outdoor seating for 60 this summer. The back deck overlooks the 32-acre property, pond and rolling hills of Virginia. Its the perfect spot for a glass of wine. 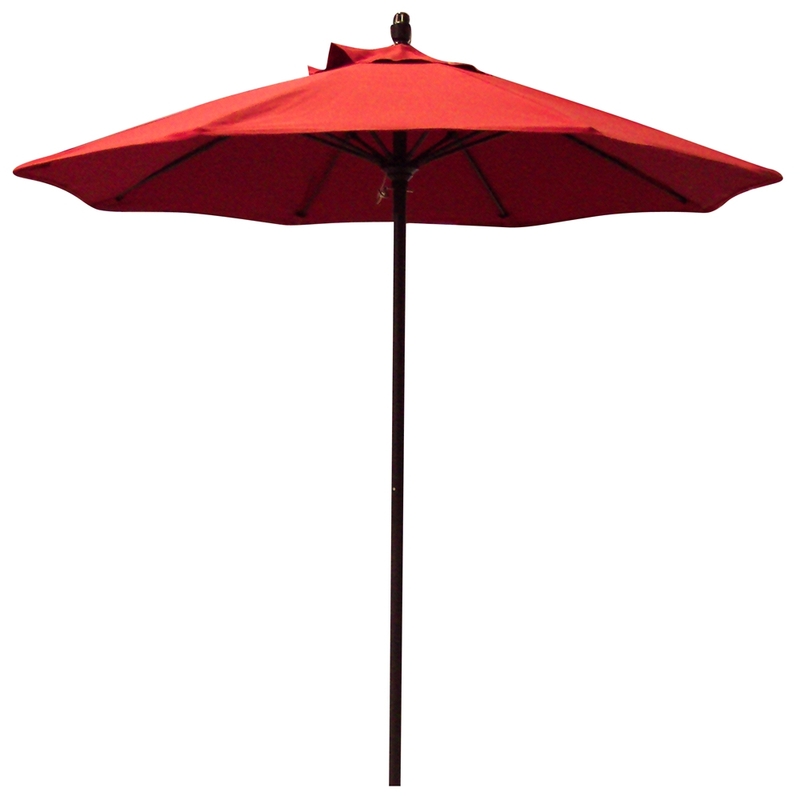 Many that own or manage a restaurant, hotel or other commercial establishment and have patio, deck or other outdoor dining have inevitability wanted to provide patrons with cover from the sun during peak hours. There are many ways to achieve this. One popular, and economic way (compared to constructing a roof, pergola, awning or other physical structure) is to install umbrellas. With the recent popularity of commercial synthetic teak outdoor restaurant furniture, manufacturers have begun creating new styles and options to offer restaurants another commercial establishments. One new creation was offering a new color option for the synthetic teak. Many of the popular styles are now available in gray synthetic teak, a darker light black teak look with a smoky looking frame to match. 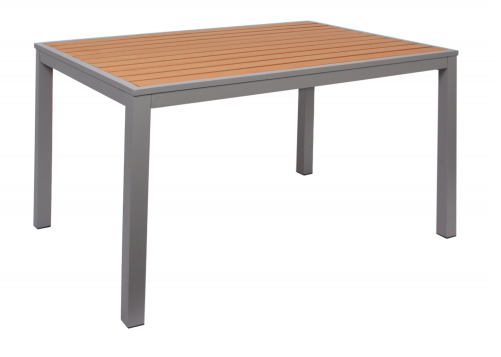 Another redesign of synthetic teak commercial outdoor restaurant table top is also available from BFM called the Longport 4-Leg. This new design a takes the old table top and table base, which had been a mix and match, two-piece combination to now create a one piece table top with four legs on each corner. The powder coated aluminum table frame comes in silver or black. The four legs are part of the frame of the table. The legs extend from the corners of the tabletop to create a sturdy and sharp, freestanding table. The design of the inlay teak remains similar to the standard Longport synthetic teak table top but offers a different look and comfortable feel. Moving the table base from one center column in the middle of the table to the four corners of the table allows for greater comfort, leg room and space for diners and patrons. Additionally, the 32" x 48" rectangle synthetic teak four leg Longport is ADA compliant and meets the requirements set forth by the Americans disabilities act. This is big for many restaurant owners in California and other states across the country which are adopting ADA requirements for tables and other accessibility features within restaurants. The four leg synthetic teak table also comes in a 32 inch table size as well as a 36 x 36 square table. The sizes are ideal for fast food restaurants, grab and go, casual dining as well as outdoor dining at four heavy meals. To learn more about all the options in synthetic teak furniture to match the four legs and that it could tabletop visit at Outdoor Restaurant Seating’s full line of synthetic teak furniture. This includes tables, chairs and other seating options and accessories. Call 610-994-1686 to learn more. With the popularity that has characterized the success of the outdoor commercial synthetic teak restaurant furniture, manufacturers like BFM Seating, have launched reinvented styles. In 2016, that style has now hit the market to a strong reception. It’s called the Seaside and includes seating and tables. For restaurants, bars, bistros, and other commercial establishments that have diners in patrons eating outside in public areas, many municipalities will require them to have fencing around the dining area. Many restaurant managers and owners do not want to go to the expense of a custom fence secured into the concrete or surface of the patio area and may opt for movable fencing. Additionally, the zoning ordinances may require that a portable or movable fence is used. 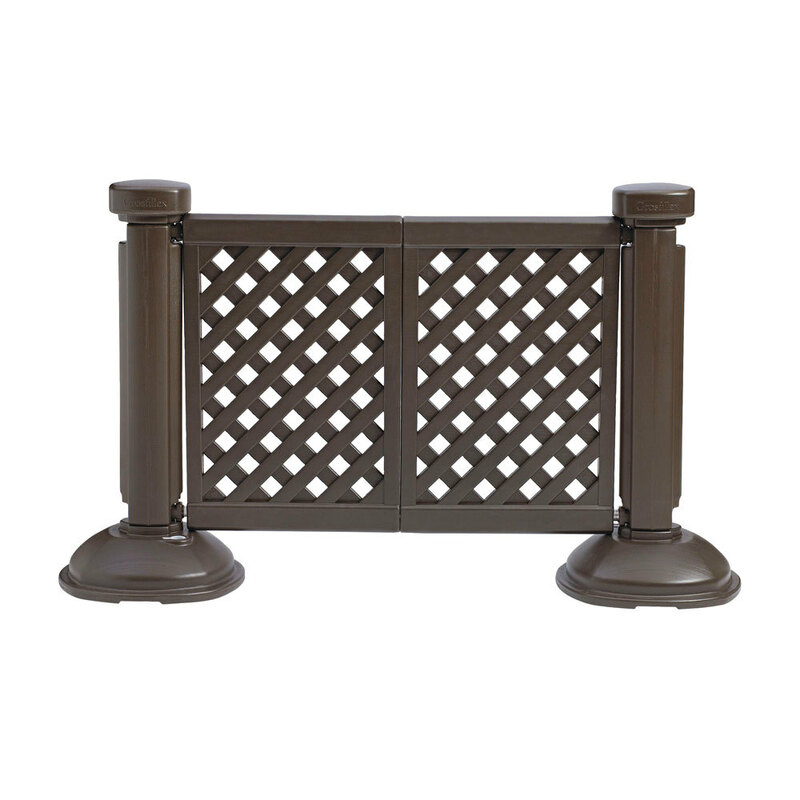 In both cases there are numerous options for movable fencing. PVC movable portable fencing is a convenient option for many reasons. First PVC fencing is lightweight yet offers a sturdy border for anyone who may lean, bump into or fall into the fence. Secondly, the PVC fencing is attractive and low maintenance.